More and more studies clearly show that gum health is directly linked to whole body health. Gum disease, a bacterially induced chronic inflammation of the gums, connective tissue, and bone supporting your teeth is a major factor in all kinds of illness, including a greater threat of developing cardiovascular disease (CVD) such as heart attacks and strokes. In fact, according to recent research, when gum disease is present, your risk of a fatal heart attack or stroke doubles. But CVD isn’t the only problem linked to gum disease, sometimes referred to as periodontal disease. Periodontal disease is also linked to certain cancers, inflammatory problems, uncontrolled diabetes, pregnancy complications, a lowered immune system and a plethora of other problems. Gum disease affects nearly 50 percent of Americans. And even though these numbers are alarmingly high, many more people have gum disease and don’t know it, because in its earliest stages, it’s painless. We recommend that all of our patients stay on a regular cleaning and hygiene schedule. Regular hygiene appointments significantly reduce the risk of periodontal disease. But even with conscientious oral care, some people are prone to periodontal disease. If we discover gum disease, we can easily and effectively treat your infection. We start your treatment with painless scaling, aided by Oraqix a topical anesthetic that will make your treatment completely comfortable – with no shots! 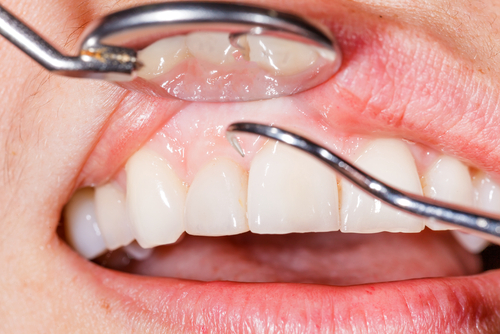 Once the source of infection has been removed, your gums will begin to heal, and tighten around your teeth. If it has been a while since your last dental cleaning, or if you have a family history of gum disease, please call us for a checkup– it could save more than your gums and teeth – it could save your life! I had recently moved to the area and was in need of good, professional dental care. A friend referred me to Dr. Stephens and I was really impressed by the friendly, professional and experienced staff. Dr. Stephens is the best in his profession with infinite patience and very skillful hands. Over time, the veneers on my front teeth were deteriorating – they had become discolored and chipped, leaving them with a grayish cast. They were even yellowing around the edges and I did not want to smile openly anymore. I thought about replacing my veneers for at least five years, and though Dr. Stephens recommended making a change, he never put any pressure on me. My teeth continued to deteriorate and after a time, I felt that repairing me teeth was no longer a luxury but a necessity. The process was long and involved but Dr. Stephens and the staff gave me frequent breaks and cheered me along. My teeth were reshaped with great care and perfection. Even the temporaries were beautiful but the final teeth are just remarkable! I smile in the mirror every day – even two years later my teeth are still beautiful! I am confident and so pleased. Thank you Dr. Stephens!